Durango Silver Co is widely known for being the best source for authentic Bisbee Turquoise cabochons and Bisbee Turquoise jewelry. Since the late 1960’s Durango Silver Co. has been using highgrade natural Bisbee Turquoise cabochon in their handmade sterling silver and gold Bisbee Turquoise jewelry. The Hartmans have always prefered to use high grade natural Turquoise and other gemstones in their jewelry, and Bisbee Turquoise is one of the highest grades of natural American Turquoise to ever come out of the ground. Bisbee Turquoise Cabochons are hard to find today since the mine has been closed for over 40 years. 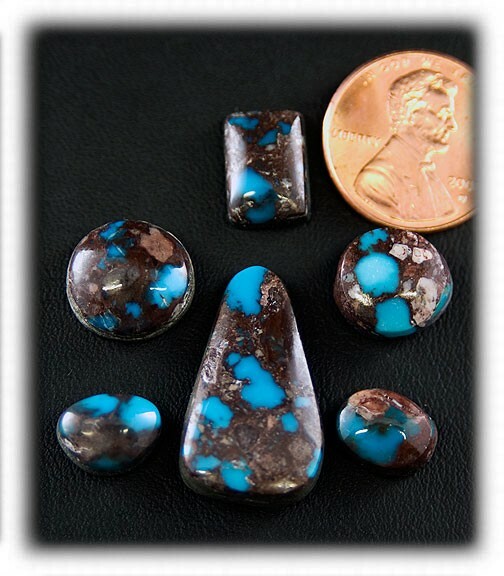 Most of the ” Bisbee Turquoise cabs ” or Bisbee Turquoise cabochons on the market today are either cut from collections of old rough Bisbee Turquoise or are vintage Bisbee Turquoise cabochons from when the mine was producing. Durango Silver Company has bought several large collections of Bisbee Turquoise over the past 10 years, including the Mickelson/Matthews collection. These Bisbee Turquoise collections have included rough Bisbee Turquoise, Bisbee Turquoise jewelry and Bisbee Turquoise cabochons. Today, DSC cuts modern cut cabochons from old stock rough. 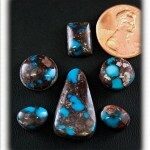 These new Bisbee Turquoise cabochons are in some ways better then the vintage cut cabochons. These new Bisbee Turquoise cabs have a higher polish and a smoother cut due to advances in stone cutting technology. Dillon and John Hartman cut Bisbee Turquoise cabochons in every shape and color including high dome cabochons. These new cabochons are also being matched for row bracelets, cluster jewelry, earrings, and more. 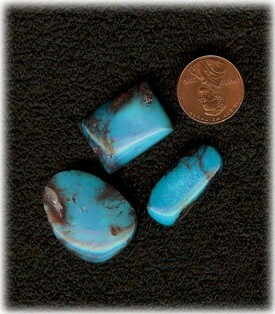 You must take a look at the Durangosilver.com website for these rare and gorgeous American Turquoise cabochons. Thank you for reading our Turquoise News about Bisbee Turquoise Cabochons.